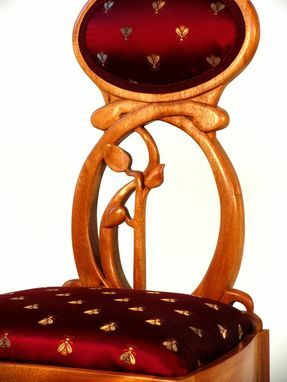 Jennifer wanted to design a chair with Art Nouveau and Arts and Crafts references for her senior year first semester Furniture Design class. The matching desk was her second semester intention. 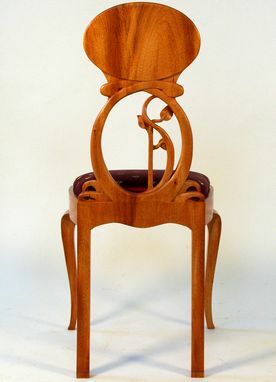 This mahogany and silk chair has sinuous lines from Art Nouveau, while the carved pattern in the splat (backrest) refers to inlays used by Stickley. 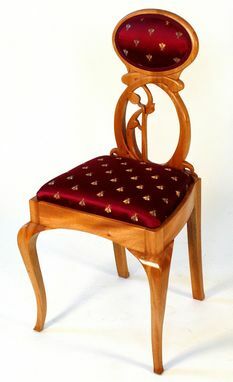 The high gloss varnish over shellac finish really makes this chair glow. The chair is petite, meant for a small person. 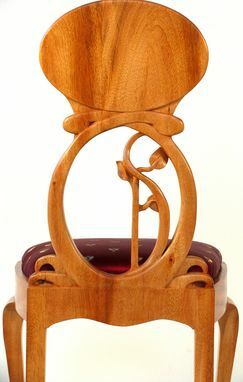 Dimensions: 40" tall, 21" wide at the knees, 17" deep.